GRN – Global Recruiters of Czech Republic is committed daily to being a professional and credible executive headhunting company. However, GRN Czech team – especially with active involvement of our CEO & Managing Partner, Mr. Michael Rainey – wants to also play a positive role in the community. 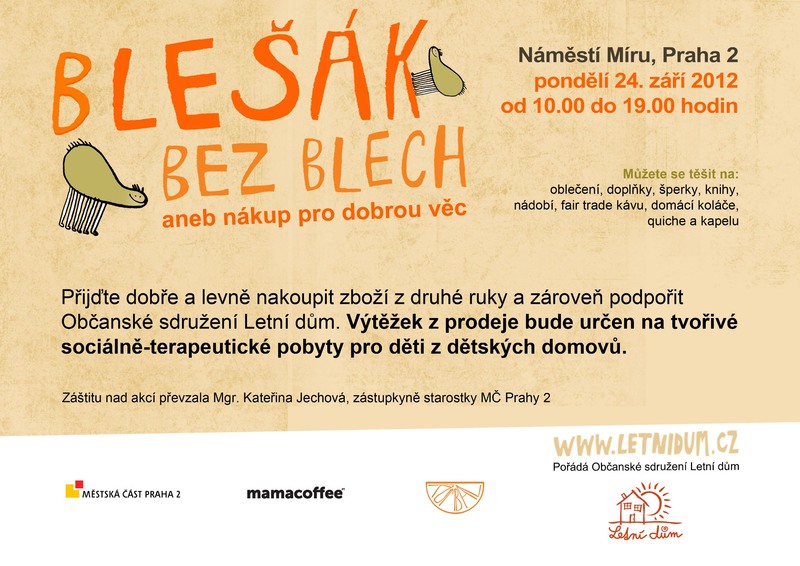 That is why, we would like to present you a charity bazaar “Blešák bez blech” (The flea market without fleas), organized by a NGO Letní dům under patronage of Mrs. Kateřina Jechová, Deputy Mayoress of Prague 2. The bazaar will take place on Monday, on 24th of September from 10 am to 7pm on Náměstí Míru, Prague 2. The aim is to raise money to support Letní dům’s activity for children in orphanages all around Czech Republic. This information is crucial for everyone who lives in Prague and surroundings and who, of course, is eager to help those less fortunate. There are two ways to support this event. With regards to the first one, you can support it if you come over to bazaar to buy something. Secondly, you can also bring to NGO Letní dům goods, you have no more need for at home. You are welcome to tell your friends about this Charity Bazaar. The more, the merrier! And, what is even more crucial, the more people come and take part in this event, the more children could be supported. Do not forget the date and the place: on Monday, September 24th, Náměstí Míru, Prague 2. We will be waiting for you!